For the two top-rated teams in this flight, a better draw would have been hard to come by. 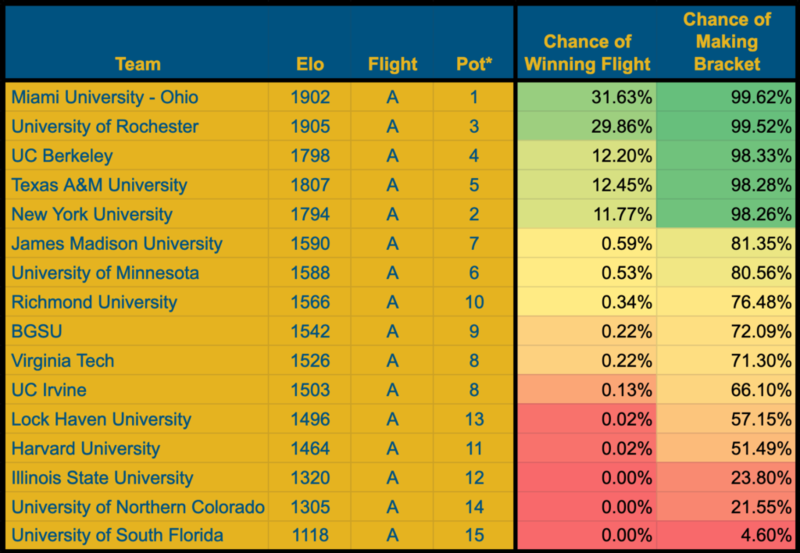 University of Rochester (ranked sixth by Elo) and Miami University-Ohio (ranked seventh by Elo) are almost even favorites to emerge from this flight with a 4-0 record and a top-four seed in bracket. 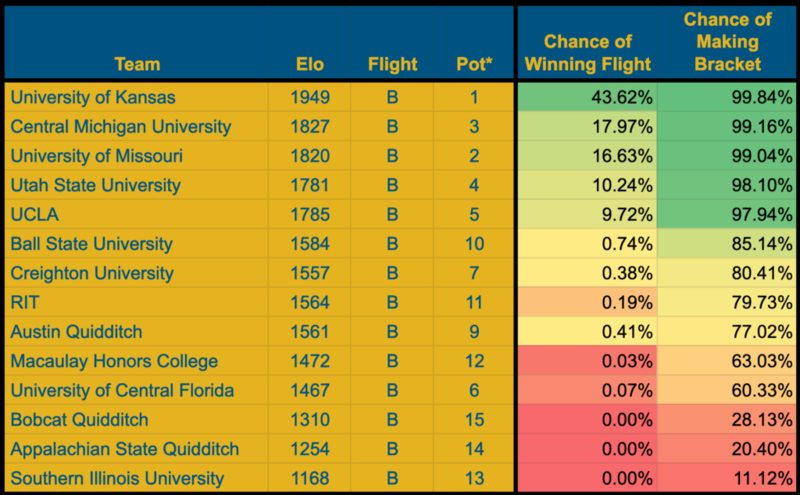 Miami, despite being the slight underdog in a head-to-head between the two teams, is actually marginally favored, due to a first-round matchup with the University of South Florida, the lowest-rated team attending USQ Cup 12. 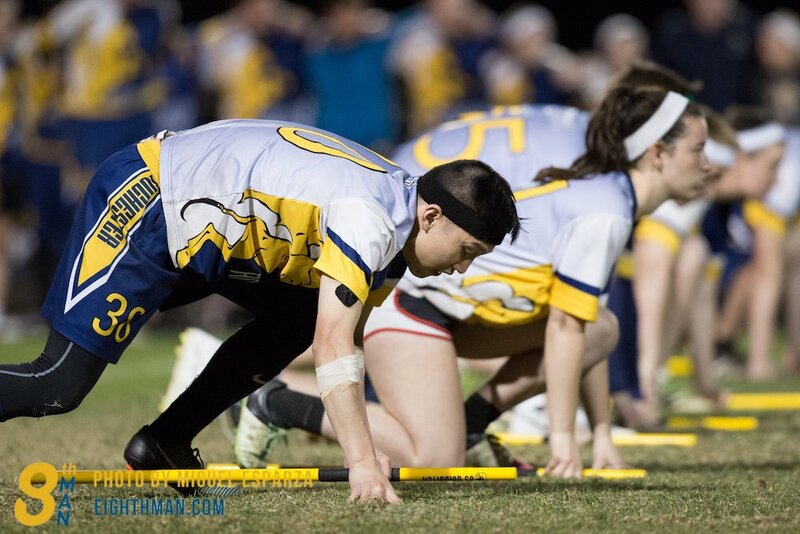 Meanwhile, Rochester’s first-round pits them against Lock Haven University who–with a rating of 1496–are both the highest-ranked pot-13 team and the only one with better odds than not to make it to bracket play. Miami and Rochester were both blessed when New York University–the lowest-rated pot-two team–was drawn for their flight, but that luck was tempered slightly by the addition of the strongest pot-five team, Texas A&M University. Texas A&M is the third-most likely team to win this flight, but to do so, they’ll need to emerge from the weeds of similarly-rated NYU and UC Berkeley, all of whom have roughly a 12 percent chance of going 4-0. 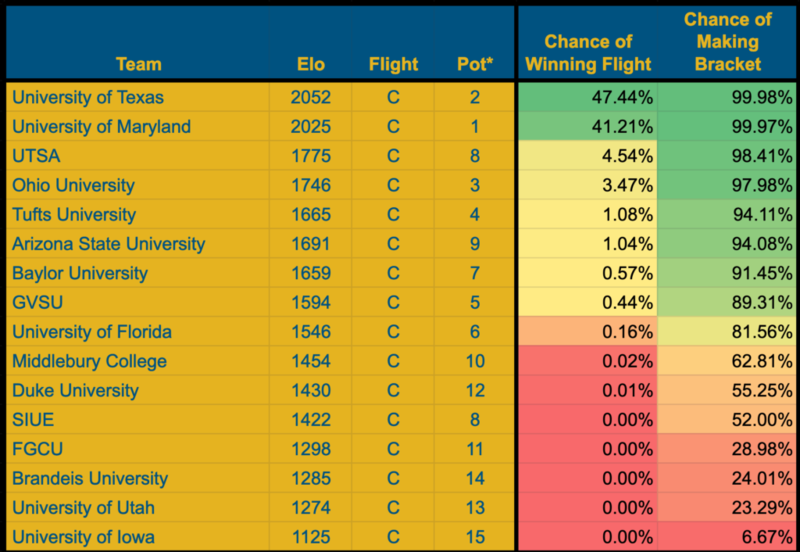 Those first five teams are clearly head-and-shoulders above the rest of the flight; the lowest of them (NYU) is still rated 204 points ahead of the next-highest team in the flight (James Madison University). All things going to plan, that gap should hold, and those teams should emerge as the five teams that leave this flight with a winning record. However, should the luck of the draw happen to pit two of these teams with a 2-1 record against one another in the final game on Saturday, we are likely to see a much lower-ranked team leave this flight with a 3-1 record, a top 20 bracket seed and ultimately be one of the most over-seeded teams in bracket play. Miami enters nationals with an 18-1 record: the best of any college team this season. Their one loss this season came in October at the Great Lakes Regional Championship to a BGSU team that went 5-5 there and had to qualify through an at-large bid. If BGSU can make their way through James Madison in their first game, we could see a rematch between Miami and the only team to crack their game plan this season. Last year’s Flight A saw James Madison and UC Irvine start the day 1-2, only to meet each other in their fourth game. James Madison won that game and made bracket, while the Anteaters were sent packing. With the way things are seeded this year, a rematch of that game–with similar stakes–could very easily occur again. Flight B’s structure is nearly identically to Flight A’s, with five teams head-and-shoulders above the rest, and three teams virtually eliminated before the brooms even leave the ground Saturday morning. That said, this flight sits a little more top-heavy, with the University of Kansas (ranked No. 5 by our Elo ratings and No. 1 by our coaches poll) as the plurality favorite to win the flight. The top five teams feature Kansas and the University of Missouri, the two finalists from the Midwest; Central Michigan University, the third-place finisher in the Great Lakes; Utah State University, the West Regional champion and UCLA, the third-place finisher in the West. Like in Flight A, each of these teams should move on with a winning record if all goes well, but a bad draw in the last round could leave one or more of these teams finishing Saturday with a 2-2 record and a play-in game in bracket. Despite being almost 200 points lower than any of those top five teams, Ball State University could be a dark horse in this flight. As a pot-10 team, they are the second-most underseeded team in the tournament and–with a 66 percent chance of beating the University of Central Florida–they are the most likely team to break seed in the first round. Despite being a pot-10 team, their three most recent games are a win against Virginia Tech (a pot-eight team), a win against the University of Michigan (a pot-two team) and an overtime game with Central Michigan. This team has shown that they can play competitively with almost anyone. Although predicted to go 2-2, they’re a team few in this flight should want to draw. Kansas and UCLA have met three times in their programs’s histories: Once in a World Cup VI quarterfinal, which UCLA won out of range; once in last year’s closest quarterfinal, which Kansas won by 20 after a catchless overtime; and once at this year’s Heroes vs. Villains Invitational II, which Kansas won out of range. Should these teams meet again in Flight B, it is likely to be another quarterfinal-quality game, with a win for either team putting them that much closer to a 4-0 flight performance and a top-four seed in bracket. After the Midwest Regional Championship collegiate final was cancelled due to inclement weather last November, many were left frustrated without a definitive answer to which team deserved the title. By putting Kansas and Mizzou in the same flight, fate seems determined to finally give us a resolution. While Mizzou enters this flight as the lower-rated team, they are currently 1-0 against Kansas this season. That being said, Kansas holds the slight edge historically, having won six out of the 10 games these Midwestern rivals have played in their teams’s histories. Utah State and UCLA have met each other twice this season, with both games ending in-range in favor of the Aggies, most recently in a regional semifinal. If these teams meet again in Flight B, UCLA would have to adjust—and that adjustment may be as simple as finally showing up with a complete roster—to find an answer for Utah State’s superior snitch-on-pitch performance built around seeker Kellan Huber, despite UCLA being the slightly-favored team by rating alone. At first glance, it might appear that the University of Texas (No. 1 in our Elo standings) and the University of Maryland (No. 2 in our Elo standings) sharing a flight was the worst possible draw they could possibly get. However, while either team might be slightly more favored against a top team from another flight, one only has to look at the the rest of the flight they drew to realize that–save for their almost inevitable flight matchup–their path on Saturday should be a relative breeze. Each of their pot three to five teams are the easiest teams they could have drawn in those slots with Ohio University rating 90 points lower than the average other pot-three team, Tufts University rating 183 points lower than the average other pot-four team, and GVSU rating 166 points lower than the average other pot-five team. Indeed, after one another, it appears that the only other unfortunate draw Texas and Maryland received was one of their pot-eight teams, UTSA, who is the most underseeded team at this tournament. For UTSA, however, they could not have asked for a better flight. After the two juggernauts at the top of their flight, they are predicted to finish thirrd in their flight, and are the only pot-eight team with greater than a 75 percent chance of making bracket play. The rest of this flight will be chaotic, however. While FGCU, Brandeis University, the University of Utah and the University of Iowa are all relative longshots to make bracket, at least one other team will be left out, as well. In a flight as middle-heavy as Flight C, that will likely be left up to the luck of the draw for the teams left 1-2 after three games. If you’re looking for veterans of the sport spectating from the sidelines, Flight C will likely be the place to look. Flight C features a huge amount of past powerhouse teams, such as Middlebury College (five national titles); Texas (three national titles and one national runner-up); Florida (one national runner-up); Baylor University, Tufts University and Maryland (one semifinal appearance a piece); and two-time West Champion Arizona State University. Outside of Texas and Maryland, most of those teams have dwindled from their zeniths, but their contributions to the sport–and the fan bases that have come with them–will be seen not just in this flight, but throughout the weekend at large. The first-round matchup between Florida and Middlebury is only the second time these programs have met and the first time they’ll meet without a title on the line. These two teams were the finalists at 2011’s World Cup V– before the majority of the players in this rematch had even entered high school–in which Middlebury took home their fifth and final championship. This time, however, Middlebury enters as the underdogs as they take on the South Regional Champion Gators. Should Texas and Maryland meet at some point, this will be the third time these teams competed against one another at a national championship, but their first time outside of bracket play. 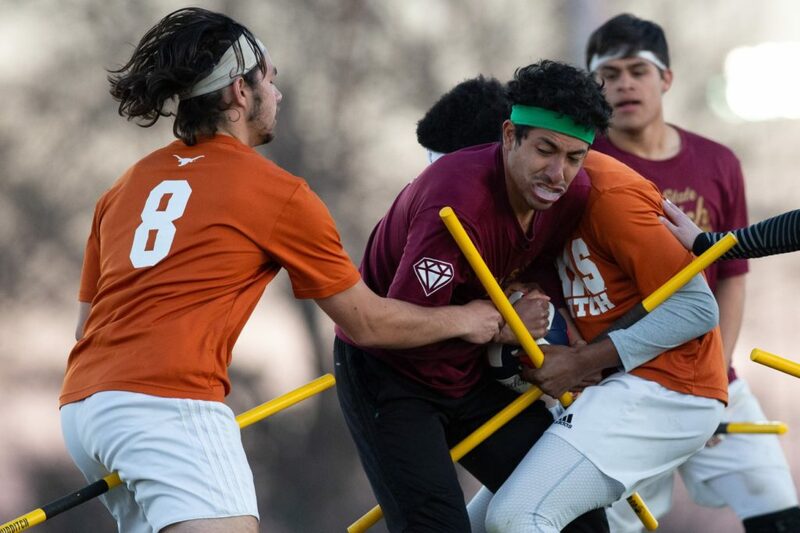 Texas won their first matchup by a snitch catch at World Cup VII and their second out-of-range at USQ Cup 11. Despite Texas being a perennial powerhouse for close to a decade, and Baylor University declining in recent years, the Bears are one of only three college teams Texas has an all-time losing record against (the other two are Kansas and the University of Rochester). This is largely due in part that–despite less than 100 miles separating their two campuses–Texas has only played Baylor once since they lost to them at the 2015 Southwest Regional Championship. With Baylor in this flight, it remains to be seen whether Texas will be able to even the score with their local rivals at a national tournament. After going a combined 0-9 against Texas Hill Country Heat, Texas Cavalry and Texas–and 23-1 against every other team this season–Texas State University was the pot-four team that nobody wanted to draw. As the fourth-highest rated team in the country by Elo and the third ranked team in The Eighth Man’s coaches collegiate poll, it was evident that they would shake up whatever flight they were put in, but Flight D added insult to injury to the three teams potted higher than Texas State. Each of the three teams seeded above Texas State received the hardest possible first-round matchup they could have gotten from the entire pool of teams attending. University of Virginia plays Silver Phoenix, rated 283 points higher than any other pot-one matchup. Michigan plays Rutgers University, rated 185 points higher than any other pot-two matchup. RPI plays Texas Tech, rated 294 points higher than any other pot-three matchup. Meanwhile, Texas State lucked into pulling the University of Illinois, not only the weakest team in the flight, but the weakest possible pot-four matchup by 167 points. After playing one of the toughest regular seasons in recent history, Texas State seems to have finally come into some luck. Despite the inverted seeding, Virginia still remains the slight favorite to win the flight, coming off of what is assuredly their best season in their program’s history. Despite finishing runners-up to Maryland at the Mid-Atlantic Regional Championship, this team has lost only six games this season, and enters nationals with only one loss in their last 12. After the top two teams, this flight gets a lot more jumbled. 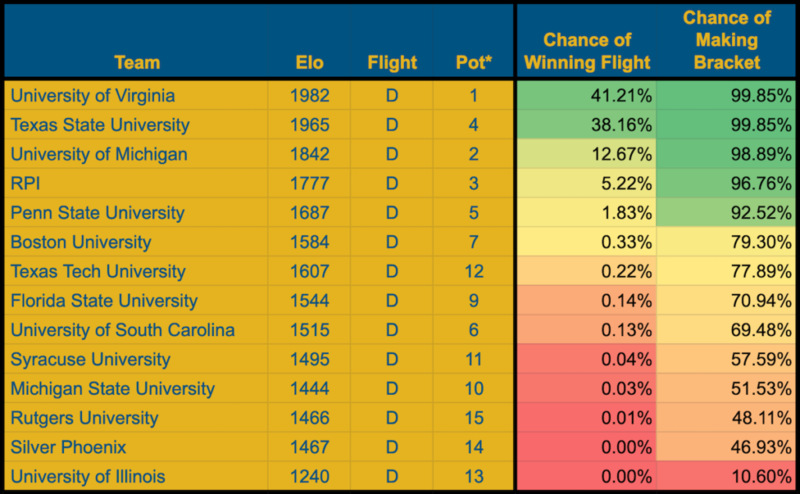 While Michigan and RPI appear to be strong enough to fight their way to a decent seed, the middle of this flight is more densely crowded than any other. A flight of only 14 teams, the draws and seeding will only get more complicated, as anywhere from nine to 11 teams may end up emerging with a 2-2 record. Because of that–with so much dependent on drawings and timing–it is likely that at least one team from this flight will have their bracket hopes made or lost by their luck in draws. Penn State University and Texas Tech matched up twice last year: once in flights and once in bracket. Penn State won both by a snitch catch and, should they meet again, their ratings put them in line for a similarly-close grudge match. Last year, Michigan State University and Syracuse University met in the play-in round of bracket play in an overtime game that Michigan State won by just 20 points. Should they meet this year, Syracuse would be the favorite, though narrowly, in a match that could be a make-or-break for either team’s chances of winding up in the bracket. Despite being national contenders for multiple years, Virginia, Texas State, Michigan and RPI have never played one another at a national tournament. With the way this flight is structured, we’re likely to see multiple games among these four teams. Chances of making bracket were determined assuming 11 teams made bracket from flights with 16 teams and 10 teams made bracket from flights with 14 teams. This article was written before the announced drop of the University of Northern Colorado team, and thus each team in Flight A’s odds may be slightly underestimated. *Pots are used based on USQ’s draw process and may not actively reflect the “seed” each team was given in-flight.